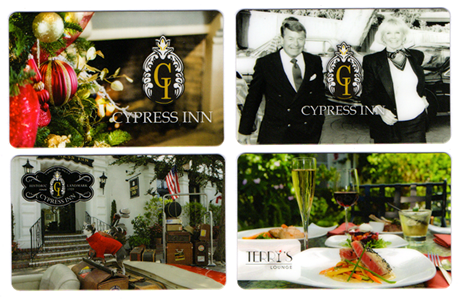 Cypress Inn, an elegant pet-friendly boutique inn located in the heart of Carmel, is a wonderful place to stay when you travel with your pet. Carmel is one of the most pet-friendly cities in the country, a place where dogs can run free on beautiful Carmel Beach, walk on leash throughout the quaint village and often find water bowls and doggie treats at many of the businesses. 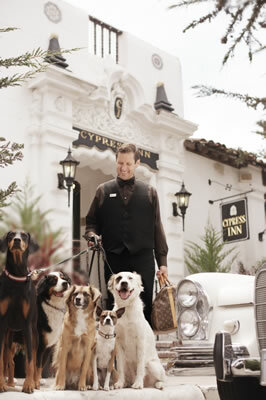 Doggie pick-up bags and a spot to wash off your pet after a romp on the beach are located in the Courtyard at Cypress Inn. Pets must not be left alone in the room at any time or under any circumstances. Pets are not allowed on the furniture in either the guest rooms or the public areas. A pet blanket will be provided for your pet for in-room use. If you wish to go to dinner or to another activity without your pet, we kindly ask that you make arrangements for your pet to be supervised. A list of approved pet sitters will be available to you at the front desk.